When photographer Chen Haiwen tried to take pictures of the Jingpo ethnic group in Yunnan province for his ambitious photo album featuring all of China's 56 ethnic groups, he ran into a problem. The locals said the Jingpo had many branches, and only the leader they recognized could gather them all for the photographs. But the leader was dead and his younger brother now lives abroad. His daughter was the only one the group recognized as their chief. Chen invited her to a banquet and explained his project. To his dismay, she remained silent and expressionless. Then she gestured to three cups of wine placed on the table. Though unsure of what she meant, Chen downed all three cups and earned her smile. They then chatted as old friends and Chen vaguely remembers some five empty wine bottles left on the table. The next day, Chen's crew was greeted with a grand reception. People from far and wide gathered in their festive costumes. The young girls even put on fashionable make-up. No one wanted the money Chen offered for their time. 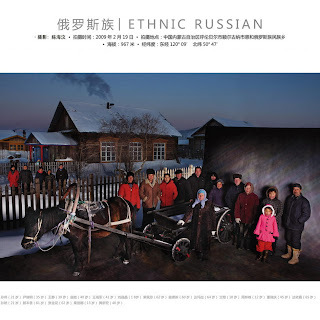 "I realized that each ethnic group has its own characteristics. The Jingpo people are frank and loyal to their friends. But if they don't know you, they can be very cautious," says Chen. Since last August, Chen has led his crew of 14 Chinese photographers through some 190,000 km in roughly 554 counties and cities. They have taken 57,228 pictures of the 56 Chinese ethnic groups. His album Harmonious China: Glimpses of 56 Chinese Ethnic Groups is on display, along with 800 other photos, at Beijing's Wangfujing until Monday. Around 450 photos from the exhibition will be compiled into another album, to showcase the nation's unity and development. It's Public Enemy, Number One!